This program applies to current Mazda customers or family members. Any new or Certified Pre-Owned Mazda vehicle, financed or leased through Mazda Financial Services. The Owner Loyalty Program rewards current Mazda customers, with preferred rates or special offers up to $1,000. Qualifying customers are eligible to receive the specified rate discount published by Mazda Canada off standard rates or the published Mazda Canada subvened lease and APR finance program rates. The interest rate cannot fall below 0%. Owner Loyalty offers are non-transferable and may be extended at Mazda Canada's discretion. Owner Loyalty Program is on top of any discount that may be offered by dealers to their valued customers. The Owner Loyalty Program rewards current Mazda customers with a 0.25% rate reduction. Qualifying customers are eligible to receive the specified rate discount published by Mazda Canada off standard rates or subvented finance program rates. The contracted consumer rate cannot fall below 0%. Owner Loyalty Cash is not offered on CPO vehicles. Send me exclusive offers and promotions. 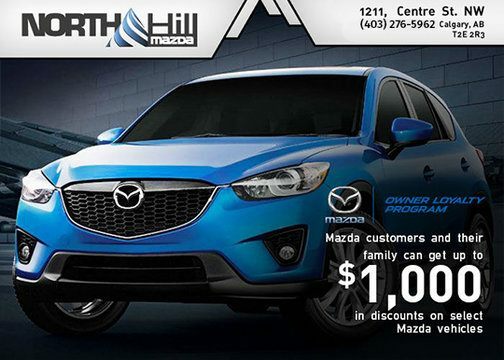 View DisclaimerBy submitting your email address or phone number, you allow us, North Hill Mazda, to include you on our contact lists to send you information about our products, services and promotions. You may revoke consent at any time by clicking on the "Unsubscribe" link in your email.